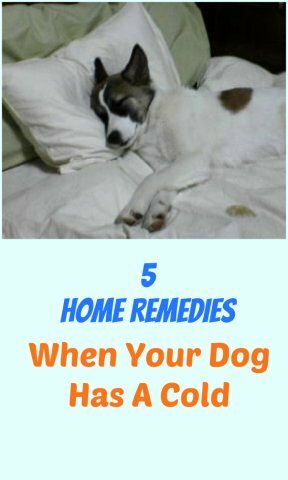 As with humans, when your dog has a cold, it is often best treated with simple home remedies to help soothe and relieve cold symptoms. But, be aware that a dog's cold symptoms may be a sign of other ailments, like kennel cough, so it's important to get him checked out by a veterinarian to make sure his illness not more serious than a cold. If your vet says home care is the best way to go, here are some easy canine cold remedies to get you started. While it may sound strange, lukewarm (not hot) chicken soup can sometimes be as beneficial to dogs in fighting a cold as it can be for humans. Low sodium chicken soup with chicken breast, cooked vegetables, and brown rice will give him the energy and nutrition he needs to help fight off the cold. Share yours! Science supports the fact that chicken soup is actually helpful in fighting a cold. Chicken soup will work to keep your dog hydrated, and his immune system up. It can also be easier to eat when he's lacking energy. Steam will make it easier for your dog to breathe when he has a virus by keeping his bronchial passages open and moist. You can do this by running hot water in the shower with the door closed and then letting him into the bathroom to breathe in the hot water for 10 minutes or so. You can also take advantage of a good vaporizer like Vicks Warm Mist Humidifier and put it in a small room with your pup. Don't leave her alone with it, however. If you like, you can add a very small amount of essential oil to the water, like eucalyptus or peppermint oil, to help your dog breathe more easily. Dogs need to stay hydrated to recover fully from a cold. Soup can help with this, but it's not enough. Make sure your dog is drinking plenty of water. Don't give her orange juice; it's good for people, not for dogs. It is better to simply give her plain water. If you must entice her to drink it, add just a bit of low sodium chicken or beef broth to the water. 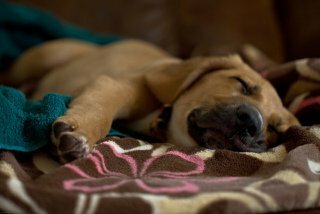 Like humans, dogs will need plenty of rest to start feeling better. Provide your pup with an insulated, warm place to sleep. Give him a nice warm blanket to sleep with, and consider heating up his bed with a warm water bottle or a heating pad. Or you can even spoil your dog with this excellent heated bed for your dog. Fruits and vegetables are natural sources of vitamins for your dog and most dogs love them. Citrus fruits, however, are not good choices for dogs. Vitamin C is important to help the immune system and I think the best Vitamin C for your dog is the sodium ascorbate version found in Ester C Canine Supplement. DO NOT give your dogs your vitamin C supplements. Be sure to check with a holistic vet, or follow instructions on the above sites, to determine which herbs would be best for your dog, and the proper dosages to prevent any potential complications or interactions with other things you are feeding your dog. You can also try giving your dog honey and/or coconut oil. Honey has impressive antibacterial, antimicrobial, antiviral, antiseptic, anti-inflammatory, and anti-fungal properties. Giving your dog a half-teaspoon to full teaspoon of honey a few times a day should be helpful to your dog in fighting off his cold. Coconut oil is also well known as an infection fighter, since it helps kill harmful bacteria, viruses, yeast, fungi, and parasites. The recommended dosage is 1 teaspoon for every 10 pounds of dog weight per day. If you are wondering if you should give your pet some more serious medicines, it's be best to consult with your doctor about that. With most colds, vets are likely to let the cold run its course itself unless it is due to a bacterial infection that they need to treat with antibiotics. DON'T GIVE YOUR DOG YOUR OWN COLD MEDICATIONS WITHOUT CONSULTING YOUR VETERINARIAN! Some ingredients in cold medicines, like caffeine or acetaminophen, can be toxic to your dog. If your dog has a cold, it's important to give him proper care to help him get better. As I mentioned earlier, be sure to take him to a vet to get his symptoms evaluated if he looks sick, so you can be sure it's not anything serious, and to get the medication necessary to help him start to feel better. Editor's Note: We received many emails and comments asking what can be done to help treat a dog's cold without a visit to the vet. If you can't afford to visit a vet, but you still need to take care of your dog, you can try to treating your dogs symptoms yourself. Here's an excellent article on diagnosing your dog's cold and how to treat it. Here's an article on some natural antibiotic options. As mentioned above, honey and coconut oil can be of great help to your dog in fighting his infection. You can also buy antibiotics for your dog online here. Originally created October 2012 and last updated February 2017.